and a superfood no less. makes me a happy girl too. Sambazon makes an Acai Smoothie Packet. but each little pack makes two bowls so I'm OK with the price. Top with Granola, sliced bananas and honey. The honey is my favorite part. I buy a wildflower honey from Whole Foods also. and/or soy milk (if you'd like) and top with fresh pineapple and grated coconut! purchase the Acai juice and freeze in ice cube trays. Makes twice as many bowls for the same price as the smoothie packs. we are taking them camping this weekend with us. Camping Trip with 15 of our favorite camping families! Watch for fun pictures on Instagram. We will welcome the rest from our labors this weekend. Wow...I love acai bowls, but the color of the Sambazon stuff seems way off in your photos. Acai should be darker. I lived in Brazil and have eaten acai for over a decade, so I know a little about real acai. I think the Sambazon stuff is fairly low quality. I've tried it and decided to never buy it again. I have found a few other companies online that have acai just like I used to get back in Brazil or even better. None of the others have the soy additives that sambazon uses, which probably explains why they are better tasting and looking...one recommendation would be Amafruits Organic Acai. Anyhow, good job on spreading the acai bowl concept, just try to find a better acai puree to use....you can't trust Whole Foods on this. one additional tip...avoid the acai juices..they are just watered-down acai purees that have been reprocessed to the point that almost all of the antioxidants are lost and that is why the juice companies have to add back food coloring. Why would you need to add food coloring to the darkest fruit around unless you really over-processed it? Be careful. Also, the juices contain about 3 times the added sugars of the frozen purees. 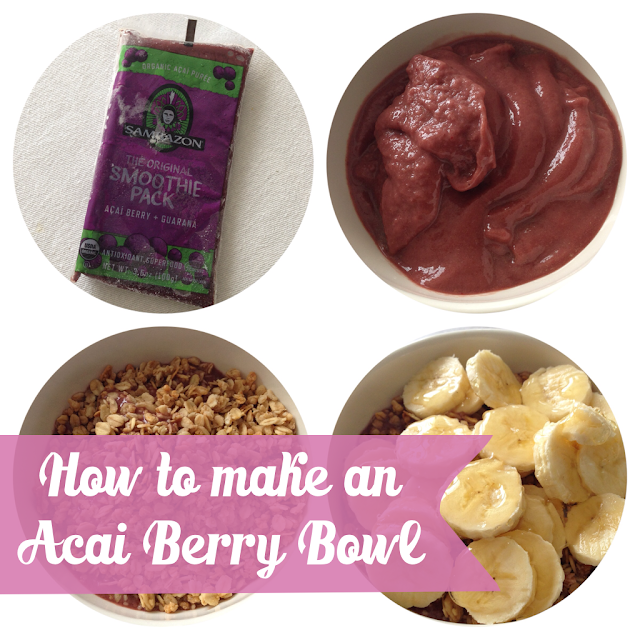 Instead, try making the acai juice at home by adding 8-10 oz of water per frozen puree pack. You'll save even more money than buying the juices, then you can do the ice cube tray suggestion. I love acai bowls and Sambazon but I've only seen the smoothies around here in NH. I have to try these though! Thanks for sharing my friend! They look fabulous - I would slurp up both servings! I've never tried them but now I'm tempted!